and sealing mortar for masonry and edging joints with stiff-plastic consistency. EASY will be mixed with 3.5 liters to 5 liters of water per 25 kg bag using a pug mill mixer or double-stirrer. To facilitate the jointing process, make sure to use a lot of water before, during and after jointing. Before jointing, the area to be jointed must be pre-wetted for sufficient amount of time, using a lot of water. This renders the stones or slabs dust-free and ensures that enough moisture is stored within the paving construction. Incorporating of the PFLASTERMEISTER JOINTING MORTAR EASY can also be done during a light drizzle. 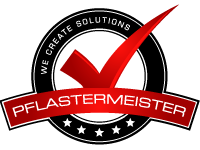 The PFLASTERMEISTER JOINTING MORTAR EASY is designed to offer a very good processing during low as well as high temperatures. Under direct insolation weathering it must be ensured that the surface is constantly kept wet. Jointing paved areas using the slurry grout method is effected by continuously pointing the joint gaps while the slurry is still wet until the joint spaces are completely filled and the jointing material in the spaces is slightly arching upwards. When jointing is completed, the jointed area must be kept moist by lightly sprinkling with water so that the JOINTING MORTAR on the surface does not start to dry on the surface. There may also be a thin water film across the entire surface. This procedure allows the cleaning (collecting the mortar residue off the surface) to be feasible for up to 1.5 hours, depending on the temperature and exposure to sunlight. Cleaning the paving is then effected by scraping off the excess JOINTING MORTAR using a squeegee; the final cleaning can then be effected with a sponge board, a sponge cleaning machine or a high pressure cleaner.